Tranquility's high performance products absorb much more fluid than leading national brands. The Peach Mat and Peach Pad Construction use a patented composite structure of tissues, super absorbent polymers, cellulose and liquid dispersing materials. - Skin remains dry with vastly improved skin integrity due to rapid fluid absorption. - Skin environment is improved when urine pH is neutralized, promoting healing where skin breakdown has already occurred. -Risks of urinary tract infections are reduced when absorbent polymers capture and retain urine, inhibiting bacterial growth. -High absorbent capacity allows for uninterrupted sleep - an essential for healing and wellness. -Fewer changes restore normal daily activity with significantly reduced anxiety and irritation. -Pathogens commonly inherent in urine, feces and blood are absorbed in the Peach Mat and Peach Pad. The results are safer disposal and enhanced infection control. -Compact absorbent design is more comfortable and discreet. -Kufguards, inner leg cuffs, provide leakage control by channeling fluids - especially bowel incontinence. -Urine pH neutralization and the reduction of bacteria reduces odors. Healthy skin, along with leakage and odor control, build confidence to pursue normal daily activities. Superior performance ends withdrawal, embarrassment and social isolation. Tranquility helps to make a pleasant atmosphere for both the user and the caregiver. -Reasonably expect 6-8 hours of use before changing. Tranquility products hold significantly higher volumes than competitive products, resulting in considerably lower total daily expense and waste. -Up to 50% cost savings; leakproof performance means fewer changes, fewer units purchased, fewer units to dispose and less labor required. -Up to 30% laundry savings; fewer bedding changes, less detergent and water usage longer linen life and less labor for caregivers. Our Peach Mat Guarantee promises unsurpassed performance in areas of skin dryness, odor reduction, urine pH neutralization, and inhibition of bacterial growth. These products help restore the incontinent person's lifestyle, confidence and peace of mind, all while protecting fragile skin. 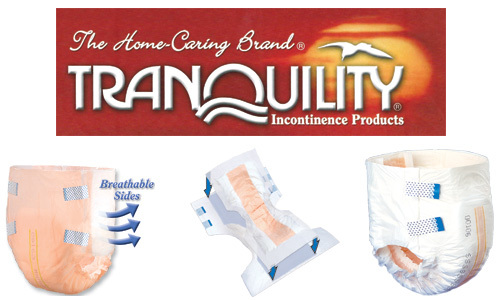 Tranquility Incontinence Products last longer between changes, saving daily expenses and waste. Our high-performing, full-line of incontinence aids provides the very best solution to all types of incontinence management issues.